BOCHUM, Germany, April 8, 2014 — An optogenetic technique is taking mood lighting to a whole new level. Serotonin imbalance in the brain has been linked to anxiety and depression, and researchers at Ruhr University have demonstrated that light can be used to restore the balance: They found that modified laboratory mice exhibited fewer anxious behaviors when exposed to blue light. 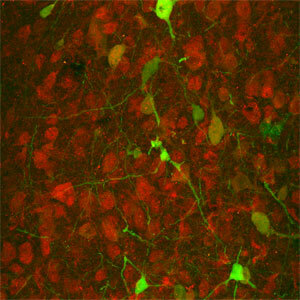 Nerve cells containing the light-activated 5-HT1A receptor (green) and the naturally occuring 5-HT1A receptor (red). Courtesy of Ruhr University. The researchers established cone opsins in the mouse eye that respond to the blue light and stimulate G protein-coupled receptors that activate serotonin signaling pathways in the brain. The receptors can be switched on within milliseconds, are extremely light-sensitive in comparison to other optogenetic tools and can be activated repeatedly. The same receptors are already targeted by many drugs used to treat anxiety and depression, according to Dr. Stefan Herlitze, a Ruhr University professor and optogenetics pioneer. The researchers also identified cone opsins in the human eye that responds similarly to red light. "We hope that, with the help of these optogenetic tools, we will be able to gain a better understanding about how anxiety and depression originate," said Ruhr University neuroscientist Dr. Olivia Masseck. The research is published in Neuron (doi: 10.1016/j.neuron.2014.01.041).